The UCT Mathematics Competition, established in 1977, is an annual event for high schools in the Western Cape. It is held on the University of Cape Town campus on an evening in April. For this year's details, go to UCT Maths Competition 2019 . Invitations are sent to more than 400 high schools in the Western Cape. Each school can enter five individuals and five pairs per grade, and over 7500 take part each year. Separate question papers are set for each grade, from 8 to 12. Trophies, calculators and book prizes are awarded for the best performances, and Gold, Merit and Participation certificates are awarded to all participants. to attract students to study mathematics at UCT. "The Oracle" is the title of a water feature close to the Mathematics Building. 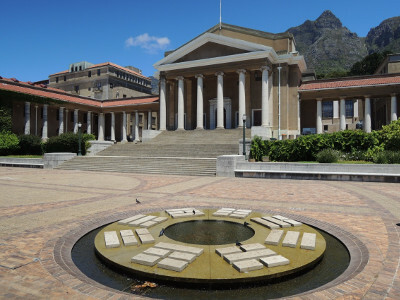 It was designed in 1987 by Bruce Arnott, Professor in the Department of Fine Art and adopted, with the permission of Professor Arnott, as the logo of the UCT Mathematics Competition in 1993. Bruce Arnott uses concentric circles of substance, space and contained movement. The central turbulent void suggests beginning, roundness suggest wholeness, stone suggests permanence and resistance, flowing water suggests flux and process, and change is suggested by permutations of broken and unbroken lines in the I CHING trigrams on the Taoist sun disc. The trigrams have specific meanings in an ancient Taoist context (although these are considered more stylistic than accurate), and Arnott notes that all the trigrams have a binary structure, or two beats to a bar, and he suggests that the disc as a whole may be described as 'a computing apparatus with psychoanalytical and prognosticatory potentials... Depending on the rules devised, the disc might also suggest a children's game, the form of a poem or novel, or the structure of a symphony or an economic theory'.